In 1905, George and Will Kissel built their first motorcar in Hartford, Wisconsin. It signalled the start of the 'Kissel Motor Company' that was officially set up in 1906. The cars sold well. Ten years after the company had been established, all the models on sale could be supplied with four, six or twelve-cylinder engines. Up to 1918, the company specialised in reliable and reasonably cheap passenger cars, but after 1918, the company entered the sports car market. In 1917, therefore the Kissel brothers introduced the 'Kissel Kar Silver Special Speedster'. From 1928 onwards, clients could also opt for an eight-cylinder 4.9 litre engine. In the meantime, work was still being carried out on the passenger cars. 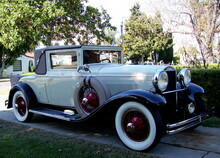 In 1929, a new model, the White Eagle was introduced, but the approaching world-wide economic crisis made large, expensive cars difficult to sell. During that year, only 931 were sold. In 1930, sales dropped to just 93 cars. For this reason, the factory was forced to shut for good in November 1930.